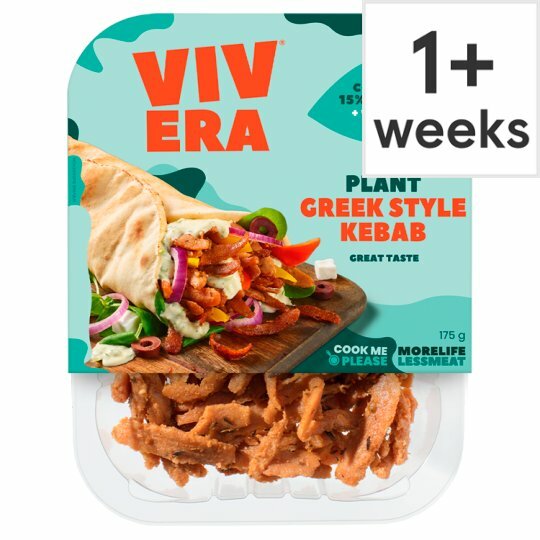 Seasoned vegan Greek kebab made from rehydrated soya protein. Keep refrigerated below 5°C, once opened keep refrigerated and use within 2 days. Do not exceed use by date. Suitable for home freezing. This product has been previously frozen and defrosted under controlled conditions without affecting the quality or safety of the product. Once frozen use within 1 month. Once defrosted, use the same day., For use by date see front of pack. Shallow Fry (From Chilled): Fry in 1 x tablespoon of hot vegetable oil for approx. 5 minutes on a medium heat, turning regularly.